A common problem - stringy algae growth is unsightly and a nuisance in the pond, growing from plants and rocks and the pond wall. Blanket weed will affect the pump performance and the pH of the pond. Blanketweed solution - naturally! 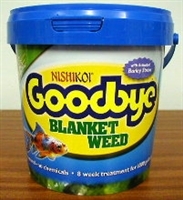 After many years research and development this unique formulation, utilising natural minerals and botanical compounds, radically produces a blanket weed resistant pond environment without the need for harsh chemicals. Pack treats 1500gal (6,800l) Effectively eradicates String algae / Blanketweed. Liquid formulation of Powder Gold. 250ml treats 1100gals. Controls algae and blanket weed by filtering out light. Restricts growth using a UV screening, faint blue dye. 250ml, treats 14000l. Blanketweed solution - naturally! 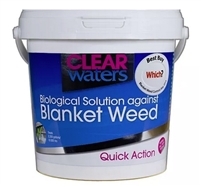 After many years research and development this unique formulation, utilising natural minerals and botanical compounds, radically produces a blanket weed resistant pond environment without the need for harsh chemicals. Pack treats 3000gal (13,638l) Controls algae and blanket weed by filtering out light. Restricts growth using a UV screening, faint blue dye. 250ml, treats 28000l. Effectively eradicates String algae / Blanketweed. Liquid formulation of Powder Gold. New pack size: 10 x 25g sachets. Treats 1000gal ten times! Kusuri Eco Pure is a biological product that degrades organic sludge, fish waste, flocculates particle matter, increases water clarity and has beneficial strains of denitrifying bacteria bio-fixed, to a dense powder catalyst. Blanket weed and algae benefit by lowering biological oxygen demand and helps to maintain clear, crystal clear, clean water. Add weekly for beneficial bacteria in Kusuri Eco Pure utilise excess nitrogen and phosphate. Every pond is different, in some ponds, Kusuri Eco Pure can work in 2 weeks, most ponds will take 4 – 8 weeks. Use early in the season followed by regular doses as a preventative. Maintenance dose. Use cup supplied; add two heaped cups per 1000 gallons of pond water. Mix measured amount into 1 gallon of pond water in a plastic bucket and stir. Apply this solution around the edge of the pond once per week. Effectively eradicates String algae / Blanketweed. Liquid formulation of Powder Gold. Kusuri Eco Gold has now been repackaged to fall in line with EU legislation and enforced by the HSE. 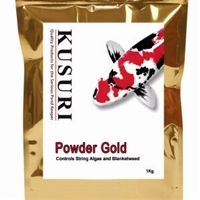 This product is now called Kusuri POWDER GOLD.